Jolyon was a Crow, one of Prince Uldrens trusted informants. He had seen much, endured much and he had held in his own two hands, the enemies most formidable weaponry. He remembered how much it stung to feel its burn on his skin. So he began tinkering. To alter its capabilities. To refine it into an even deadlier weapon. He liked seeing how things worked, how they looked folded out on a work table. The original weapon had an incredible force spread out over a wide range in order to capture as much as possible in its embrace. However, what if the weapons influence was focused into a single burst. An experienced fighter would be able to deliver maximum punishment with its unforgiving fire. The ones that betrayed the Reef would know nothing else. The Wolves deserved nothing else. Fire and Blood would be their masters and the Lord of Wolves would deliver it. What can be said about the Lord of Wolves that would give it justice? This exotic is a weapon meant for demolishing and tearing apart in a blaze of fire. It has a fast fire rate and each shot is similar to a pulse rifle in that it fires a burst of bullets at your target or targets. It fires in a 6 shot burst that can put all lower enemies into the ground and even put down some higher level enemies with negligible difficulty. It has a high impact and an incredibly high magazine so you can continually deal out high damage, left, right and centre. Its exotic perk serves to rally your allies to your side to launch a singular offensive that will tear apart all who oppose you. It is known as Devils Touch and serves to boost nearby allies with a +3 recovery rate on a successful kill. This lasts for 30 seconds. Having this perk is incredibly useful as it can cause your allies to remain in the fight for longer or to get back into the fight if they had been run down and are low on health. It allows for an unrelenting and powerful force, pushing against the forces of the Darkness. In PVE and PVP alike, this is an ideal exotic, as like stated earlier, it can put down most enemies with ease and this is true in the Crucible as well, with it being able to tear down opposing Guardians with one burst. Due to its origins as a Fallen shrapnel launcher, the Lord of Wolves has a decidedly Fallen influence with the brown plating that covers this exotic shotgun. The barrel and muzzle gives off an incredibly hostile vibe as it almost appears to be pincers that are closing in around the muzzle. 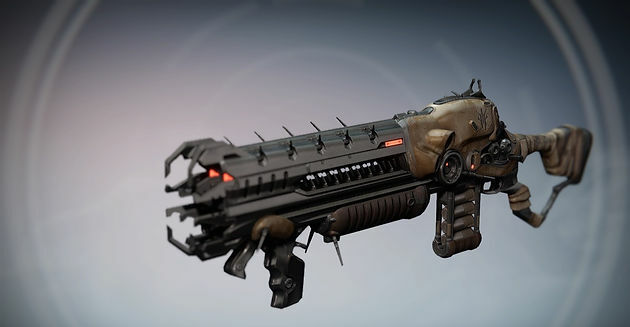 It has two main grips, one at the front and one at the back near the trigger and the need for two comes off the fact that the Lord of Wolves has a large amount of kickback. On the side of the shotgun towards the back there appears to be the symbol of the House of Devils, perhaps marking the origin of where the original shrapnel launcher had come from or maybe the technology within this exotic came from the House of Devils themselves. Lastly we can see in the magazine, the sheer size and thickness of the shells, which further showcase this guns power. This weapon can be obtained by completing the Challenge of the Elders. One of the three exotic Fallen themed weapons can drop as an end of match reward after defeating all three Ultras of that weeks challenge. It is not guaranteed that you will gain an exotic and when you do, it is not guaranteed that it will be this one but the drop rates are rather high.